Harry King who has 3 three platinum albums and two gold singles to his credits gives a rousing patriotic rendition of FREEDOM ISIN'T FREE and its true meaning ! The Song Freedom isn't Free in words and music tells the true meaning of patriotism and sacrifice of those who have died for our country and those who must live for our country. Just as the Founding Father created our living document the U.S. Constitution ...it will only live by the Grace of God an the willingness of We the People to preserve, protect, and defend our country through our Constitution. We need to ARM ourselves with our dedication to all our Constitution. If we walk away from our Government we are walking away from ourselves. We the people will destroy what our Forefathers created and so many died to preserve. Ben Franklin warned us that We the People had a Republic if we could keep it ! Let' keep it for ourselves, our children, our grandchildren and for all future generations of Americans. 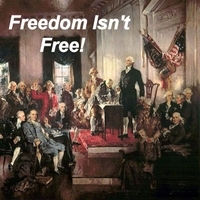 True, FREEDOM ISN'T FREE ! !